Leeds United’s teenage midfielder, named after the Brazilian legend, is rapidly making a name for himself in the game. Phil Hay spoke to Simon Collins, the man who helped nurture the Africa-born rising star. The story of how Ronaldo Vieira found his way to Leeds United would be incomplete without any reference to the clubs who said no. Manchester City were first to look at him and his twin brother Romario without taking them on. Hull City liked Ronaldo but refused to fund the cost of his travel from Leeds. A short trial at Barnsley was another dead end. Football is strangely subjective and even Billy Bremner, Leeds’ most iconic player, waded through the demoralising experience of Arsenal and Chelsea rejecting him on the grounds of height before sticking his studs in their throats but Vieira was in danger of being lost to the game three years ago. This is the boy who spoke precious little English when his family emigrated from Portugal in 2011. This is the boy who was 17 when Leeds finally picked him up. Even the Vieiras’ relocation to England was a decision based on circumstance rather than choice. Ronaldo has talked of his father struggling to find work at a time of economic strife in Portugal and of his mum holding down two jobs to pay for their keep. Born in Guinea-Bissau in West Africa, he and his brother found a way into Benfica’s youngest youth teams but left Lisbon before Benfica could make anything of them. Simon Collins, once a development coach with Leeds and at the time a member of Manchester City’s staff, encountered the Vieira twins a year or so after they settled in Yorkshire. He remembers Romario as “the organiser, the one who spoke a bit of English, the one who got them from here to there”. He remembers being told how he was “taking the p***” when he informed a colleague about two talented Portuguese teenagers with names to die for. The brothers were playing for Batley Phoenix in the Huddersfield Junior League and earned the chance to trial for Manchester City at a development centre set up by City at Thomas Danby College. “It didn’t work out,” Collins says, “but I was running an Under-15s team at Wortley Juniors so I suggested they come and train with us. They were Under-13s, two years younger than everyone else, but it didn’t matter. The two of them were fantastic. Collins left Wortley Juniors and for a short time, in his words, the Vieiras fizzled out. But in 2014, Inspire 2 Independence – a company establish with the original aim of finding work for the unemployed – created the i2i Football Academy in York, a training centre based at and allied with York College. Mike Morton, who had also worked previously with Leeds and Manchester City, took the role of head of academy and Collins joined as head coach. They combined those jobs with running the first team at non-league Tadcaster Albion. “I’d kept in touch with the boys (the Vieiras) via social media,” Collins says. The Vieiras’ parents were football fanatics and obsessed with the Brazilian game. The Vieiras had moved from Birstall to Gipton by then and the brothers were attending the Co-operative Academy school, not far off the A64 in central Leeds. Collins’ commute from Headingley to York allowed him to drive them through. Alongside their coaching with i2i, Ronaldo and Romario began business courses at York College. Ronaldo completed his before turning professional with Leeds last year. Romario gravitated to a sports-related course. Ronaldo spent two years with i2i before a short trial with Leeds earned him a scholarship. By then, Barnsley and Hull had cast their eye over him but decided not to bother. “Barnsley said no,” Collins says. “With Hull it was more down to the fact that they weren’t willing to pay for his travel. I think they were keen but it wasn’t really possible for him to get there without some help. Ronaldo was tied to a two-year scholarship in 2015 but did not get 12 months through that deal before Leeds gave him a senior contract. 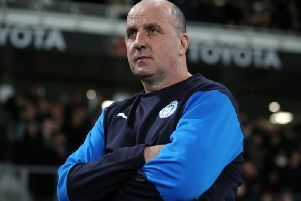 He turned professional on May 5, 2016 and made his debut as a substitute away at Preston North End two days later, the last game of Steve Evans’ reign as head coach. “We were at that game,” Collins says. “It gave me chills down my back watching a player who had worked with us coming on in the Championship.” He felt the same when he sat down in front of the television for the second half of Leeds’ 1-0 win over Derby last Friday. Vieira was bombastic and Derby manager Steve McClaren summed up the 18-year-old’s performance in the centre of midfield in two words. “Vieira. Wow.” “When we first set all this up at i2i I think the ultimate goal was to see one of our players on live TV in a game like that,” Collins says. Throughout their lives, from street football in Guinea-Bissau to the structure of Thorp Arch, the Vieira brothers have gone hand-in-hand. Romario followed Ronaldo into the academy at Thorp Arch and when the latter agreed an improved contract last September, Romario signed his first professional deal on the same day. Ex-Leeds striker Richard Cresswell acts for i2i as one of their agents. Romario, a holding midfielder, showed enough talent in his younger years for Collins to think that he can do what his exceptional twin is doing now. His twin is so exceptional and so highly rated by the likes of McClaren that Leeds might find themselves offering Ronaldo another contract before long. “What we try to say to these players, especially those who’ve been in club academies and then left, is that it doesn’t have to be the end for them,” Collins said. “They’re still young enough to find a career in football. I don’t know if Ronaldo or Romario thought it would happen but we wanted to help them and they were willing to help themselves.” As stories go, this is one to follow.